Black Ice Software® announces the release of version 5.10 of the Print2RDP with an improved default printer detection, better installation, and better logging to troubleshoot ill behaved printers. Customers with version 5.00 or higher can upgrade for free by downloading and installing v5.10 and using their existing serial key. Customers with version 4.9x or lower will need to purchase an upgrade first. 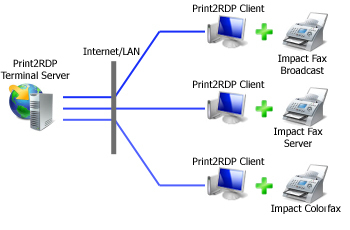 When Print2RDP is combined with an Impact Fax product, Terminal Server users can fax both local and remotely stored documents with 2 clicks of a mouse! Remote Print to Local Faxing with 2 clicks! Easy Print? Printers on Windows 2008 Servers? In the RDP connection, there might be printers with the word " - redirected" in their name. These printers are not attached by Print2RDP. They are attached by Microsoft's newly developed Easy Print feature available on Windows Servers 2008 or higher. We often receive requests from customers to remove or turn off the Microsoft Easy Print Feature. By default, Windows 2008 Servers have the Terminal Services Easy Print driver enabled. 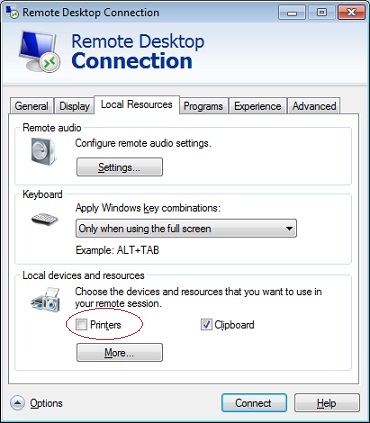 It is easiest to disable in the Remote Desktop Connection Dialog. If you are remotely connecting into a Windows XP Pro, Vista or Windows 7 use Print2XP to solve your RDP Printing problems. Configuration Free, Install and forget!